The five of us flew to Washington D.C. to visit the Nations' Capitol and also take excursions to Philadelphia, Baltimore, and New York City. 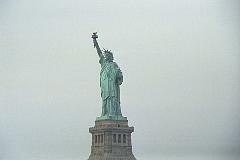 In retrospect, we took our trip just before a juncture in U.S. history - the terrorist acts of 9/11. We saw Washington and New York City before the explicit threat of terrorism now prevents access to some of the sites we visited. Afterwards, the White House was closed to tours, and of course the Twin Towers are gone. We chose not to go up in them because it would have cost us 15$ apiece. Now, of course, we regret it. I have a few pictures showing the Twin Towers on this page and also on 'Brooklyn Bridge'. We left Times Square and took the subway to Battery Park. It was warm but very hazy. 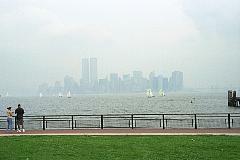 There were at least five different boats conveying people out to the NY Harbor and Ellis Island. 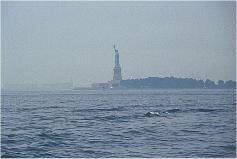 We almost took Miss Liberty - this boat. The swell from the harbor caused the boat to bang violently against the pier - so badly, in fact, that they stopped unloading passengers for about five minutes. This made the boat late and as another boat approached, this one stopped taking on passengers and abruptly left. I can't remember the name of the boat we took. We sat on the top deck in the back on benches. It was standing room only by the time we left, so we were surrounded by people and couldn't see much as we crossed. I made my way to the rail to take the requisite picture of the statue. Not too bad with the haze and all. 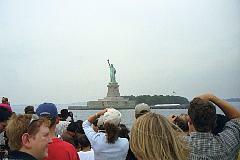 Here she is as we pass by on the boat. This gives you a good perspective of people and the statue. Downtown Manhattan rises from the mist.